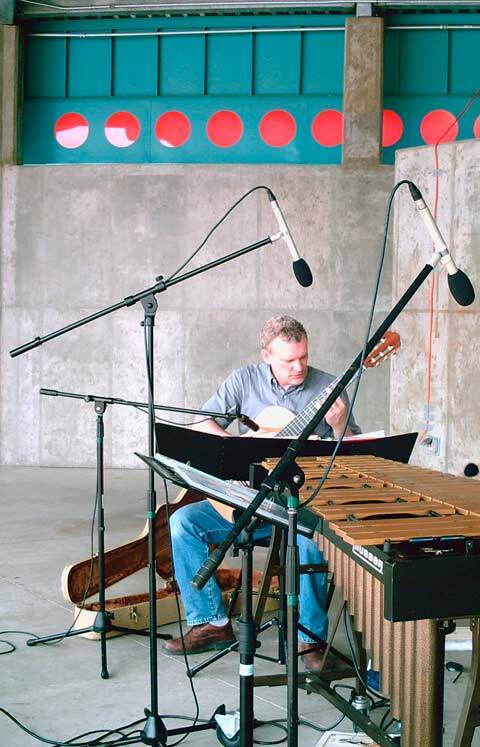 Jeff Anvinson has performed all over the place - New York City, Shanghai, Winnipeg, Minneapolis, Philadelphia, Nanchang, and yes, even in relatively tiny Grand Forks, ND! A classically-and-jazz-trained guitarist (with some other guitar training thrown in), he has performed a dizzyingly wide variety of music - including classical, jazz, rock, pop, musical theater, ragtime, blues, and more. He has performed in front of crowds numbering in the thousands as well as small, intimate venues with only a handful of people present. The list of musicians he has performed with include vocalists, guitarists, bassists, pianists, violinists, violists (what's a "violist"? ), cellists, saxophonists, flutists, vibraphonists, percussionists, and more - plus he's been a soloist with orchestras, wind ensembles, and choirs. Over a career that's lasted thirty-five years and counting, he's been lucky enough to live and breathe a lot of what a life in music has to offer. 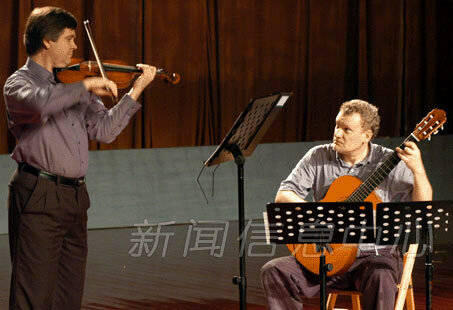 We won't mention that he's also been a music critic, online classical radio announcer, part-time music engraver, conductor of a guitar ensemble, teacher at every level possible, composer, arranger, and more . . . oops, we mentioned them! :-) (Check out his bio on his personal website, www.jeffanvinson.com if you really want to know all the gory details.) Since I'm writing this myself (Hi I'm Jeff) I better not test the boundaries of humility, but I'm very proud to have had such a varied music career (plus somewhat lucky and normally humble). But reading about me isn't probably why you're here. Besides all those things I ran on about above, what I often enjoy doing the most is playing solo for weddings, receptions, anniversaries, and gatherings of all kinds. I enjoy being in the background, just playing away while people are busy mingling. This is my kind of thing. (I'm really quite modest.) So if you're looking for pleasant, non-obtrusive, background music - such as a wedding or other gathering of people - please keep me in mind. 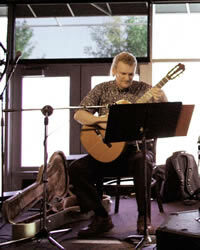 A classical guitar with a simple set-up is perfect for a lot of events and more affordable than you might think. Please check out my recordings below. You'll find lots of classical music clips (mostly because the composers are all dead and aren't eligible for help from copyright lawyers), but I can also play jazz, pop, blues, ragtime, and other styles. Plus I can sing - specializing in jazz standards and pop music. If you're looking for someone to sing a special song in any style, I can probably learn it and perform it. One more thing: Don't expect the recordings below to be perfect; I threw them together for one of my former clients, a bride-to-be who I worked with to find music for her wedding. I present them here, warts and all. Please don't hesitate to contact me if you have any questions or would like to talk to me about performing for your event. You can contact me at jla@jlamusic.com. By the way, if you're looking for a guitarist to solo with your orchestra (Vivaldi Guitar Concertos), wind ensemble (Chaos Theory! ), choir (Jeffrey Van's wonderful "A Procession Winding Around Me"), or chamber group (one of the Boccherini guitar quintets would be lovely! ), I love doing that sort of thing. your browser or device may not support them.